It's that time of year...when crafters, artists, designers and manufacturers head to sunny southern california for the annual craft and hobby tradeshow...CHA winter mega show! This is a great event for networking, researching trends and meeting up with all my artsy/crafty friends. This year I will be attending a few workshops, meetings, walking the show floor and will be speaking on a panel about online workshops. Taking Your Classes to the Virtual Space - ONLINE! Join a panel of online craft & art instructors with a variety of experience teaching online to discuss the pros and cons of teaching online and various methods that can be used to reach an international audience without leaving home. Topics include live streaming, using an online "school" to host classes, self-hosted web classes, and more. p.s. if you are going to be there..leave a comment and let us know what booth you'll be at. 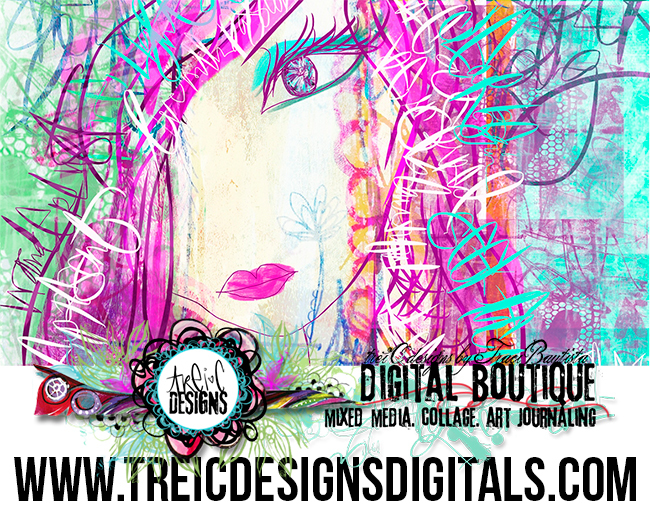 Follow my dailly CHA adventures on Instagram @treicdesigns. join me for my final 2013 event in Glendale, CA!!! This event is sponsored by iLoveTo Create. I'll be painting and sharing my fave ILTC paints and of course, Collage Pauge techniques! It's a FREE event where you can come play with all the paints, tools and make your very own graffiti canvas! Check out the Summerville and Fresno graffiti CANVAS PLAY party pics! Join in the fun, giveaways and festivities. Grab your 50% coupon and more details here. I'm getting ready to move my studio in a couple of weeks and I'm having a MOVING sale. Come by this Saturday, September 21, 2013!! I'll have a lot of great deals including mixed media supplies, art journaling/collage kits, fabric, stamps, remnant kits, paper, graffiti canvases, handmade journals and lots of art. I will be selling one of the larger display vintage armoire, tables and antique storage drawers too! the front door is facing West Prospect between Railroad and Hartz. there is a FREE 3-hr parking lot across the street from the studio. keep in mind Saturdays are busy in Downtown Danville because of the Farmer's Market. see you Saturday! NOTE: The studio is only open during my studio sale. Don't worry if you are not local. I'll also be having a HUGE online pop-up sale via Instagram/Facebook and in my online shoppe. I'll be posting photos of items for sale throughout October. Follow my Facebook and Instagram feeds for more details. Calling all you lovely art journalers!! I'm super excited to announce I'll be teaching at Art Journaling LIVE! Join the Cloth Paper Scissors team for a magic day with Julie Fei-Fan Balzer, Pam Carriker, Dina Wakley and me. Learn the tips, tricks, secrets, and terrific techniques to take your art journaling to the next level in this spectacular all-day event. Julie, Pam, Dina and I will lead you through four fun-filled individual classes with all the supplies you’ll need for the entire event. It's all about the Face Mask with Pam Carriker, author of Art at the Speed of Life and her NEW book Creating Art at the Speed of Life! Most of us try to put our best face forward, but often underneath there are many things going on that our outward appearance masks. In this self-examining art journaling exercise, you’ll learn masking techniques for creating a "safe zone" to unload those thoughts and feelings our outward mask hides. From the silly to the serious, recording your inner thoughts in an artistic way is a valuable self-awareness tool and the mixed-media process satisfies the creative soul. Get ready to play with paint...Color and Pattern Play with Julie Fei-Fan Balzer, author of Carve, Stamp, Play! Learn how easy it is to create complicated patterns full of color and energy. And speaking of color, we'll be mixing up our own custom colors so that your art journal pages are bursting with your own unique flavor! Paint it Out with Dina Wakley, author of Art Journal Freedom! Join Dina for a fun, therapeutic art experience. You'll start by creating a mess! You’ll scribble, make marks, write out thoughts and feelings, and let the emotions spill. Anything goes! Then you'll examine your messes and find shapes and forms in the chaos. Learn how to isolate the shapes and forms and to create beauty from the mess. You'll end with lots of layers that peek out, interact, and vibrate with meaning. 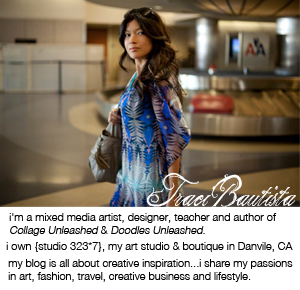 If you've read Collage Unleashed or Doodles Unleashed...you'll love the sneak peek into my new book. Dive into Printmaking Unleashed with me! Create art journal backgrounds and collage papers using handmade tools. Explore mark making and create colorful layers with simple printmaking techniques using prints, paper cutouts and monotypes. Learn how to add mark making, custom colors and patterns, and printmaking to your journals. Use stencils and masks to take your journal sessions to a deeper level of self discovery. Scribble, paint, doodle, and journal your way through a fun and exciting day of artistic explorations. This is going to be an event you won't want to miss..so come join us in Charlotte! For more details and to register visit Art Journaling LIVE. Join me for my final weekend retreat in 2013...registration is OPEN! unfold...be FREE...PLAY...this is the core message of all my workshops. 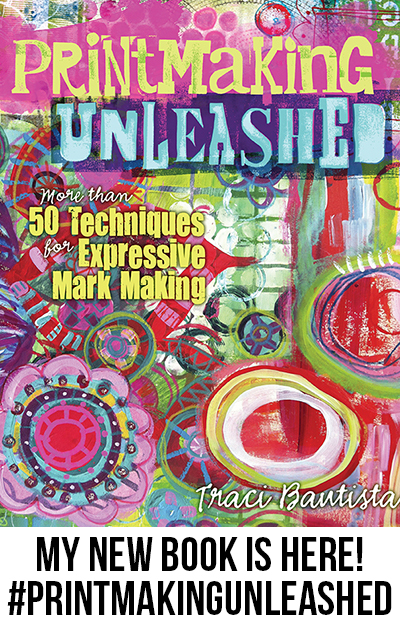 you'll cultivate your creative soul while experimenting with mark-making, color explorations and book-binding. During this 3-day workshop, you'll build a one-of-a-kind art journal with painted fabrics and papers wrapped with an embellished fiber spine. Explore printmaking, color studies, doodling, collage and book making. The art journal is a space to spill your dreams, hopes, fears and ideas. You'll spend time creating personal graffiti and embark on a photo excursion journey & shopping tour of downtown Danville. Each day is full of guided instruction and one optional evening OPEN studio session. Check out photos from my winter 2013 and spring 2013 art journaling retreats. Join me for an artful weekend of mixed media PLAY at my studio! Early bird registration until 8/15/2013...SAVE $50! space is limited. A couple of weekends ago, I had the pleasure of hosting a Graffiti Canvas PLAY party at the grand opening of JoAnn Fabric and Craft Store in Summerville, SC. It was a great day full inspiration, where I shared fabric painting techniques using my fave ILoveTo Create products. Join me for the next play party & book signing in Fresno, CA this weekend! Come out to this FREE event and have fun painting a colorful canvas! color mixing. color palettes. exploration. PLEXI printmaking. handmade tools. SMILES. neon colors. pens + markers doodles UNLEASHED. hot glue stencils. handmade printing plates. foam stamps. white pens. laughter. digital ideas. book binding. waxed polyester. fibers. sewing. mark-making. dimensional paint. graffiti scribbled monoprints. FUN! art journaling. loads of inspiration. Don't forget to check out all the FREE Tie Dye Your Summer #TDYS events coming to a California city near you!